he Nuclear Proliferation Treaty took effect. The Beatles disbanded. A Boeing 747 went to London and Apollo 13 safely landed. For many reasons, the year 1970 stands out in American and world history. So, too, in Colorado. The year 1970 marked the establishment of the state’s third and present Court of Appeals. It is also birth year of the one of the newest judge on that court’s bench — the Honorable Craig Welling. Born in Omaha, Judge Welling (almost) always knew he wanted to be a lawyer. The caveat refers to a brief phase at the age of four, when he exclaimed suddenly but emphatically to his grandmother, “I am Duck the Mechanic.” To this day, he does not know where he derived the namesake Duck, and can only loosely associate the mechanic statement to his beloved toy at the time — a pedal fire engine. A young child known for his creative imagination and abundant imaginary friends, young Craig worked tirelessly on the pedal fire engine. However, perhaps he grew fatigued of the labor, because from then on, he only recalls ever wanting to be a lawyer. Although raised primarily by his single mother, his father practiced law, and young Craig listened in earnest as his father described his cases. In the 8th grade, he eagerly accepted his father’s invitation to observe trial. He still recalls donning the only suit he owned, accompanying his father to the courtroom and watching as his father represented a client who was brutally tackled after two security guards misidentified him as a shoplifter. The case occurred more than 30 years ago, but the thrill of the experience never faded. Craig’s fate was sealed: he would be a lawyer. His exact journey to a Juris Doctor, however, would prove less direct. To begin, his mother was less enthusiastic about his career choice. Having married — and divorced — a lawyer, she had two rules as he embarked on the path to the law: (1) “Don’t be a jerk”; and (2) he had to get a degree in something that would not necessarily require law as a career. So, with that, young Craig attended Colorado State University in (less than earnest) pursuit of a degree in chemical engineering. His notable absence from class and subpar grades reflected his lack of enthusiasm for the hard sciences, but his extracurricular activities earned him campus renown. He was active in student politics serving as student body president; and, with the encouragement of his college professor, Susan Kirkpatrick, he even ran for Fort Collins City Council. Despite his serious effort to run a dignified campaign on an affordable housing platform, including arduous door-to-door outreach, strategic yard sign placement, proactive fundraising and a can-do attitude, he only managed to garner 398 votes. He still laments that college students do not vote in city elections. Still, his unsuccessful run was not for naught. His political platform caught the city’s attention and he was appointed to serve as vice chair on the then-newly created Fort Collins Affordable Housing Board. And, 20 years later, he would advise the same professor who encouraged him to run as she served on Governor Ritter’s cabinet. Young Craig achieved other successes in college as well. Indeed, it was at CSU that he met his wife, Kyung. Kyung was involved in ROTC, and while young Craig circled his CSU victory lap year, she was stationed in Korea. Despite an ocean of separation, astronomical phone bills and the odds against them, the two stayed in touch — and very much in love. Kyung was then stationed in Philadelphia, and without concrete postgraduate plans of his own, he accompanied her east. The two embarked on their new adventure from Kyung’s home base in Arizona. On the way, they stopped to behold the Grand Canyon. As they wondered at the cavernous landscape, young Craig dropped to one knee. Kyung jokingly hemmed and hawed, requesting to think about his scenic proposal. Of course, she eventually said yes and the two continued on to Philly. They married in June 1996. Upon arriving in Pennsylvania, young Craig began to contemplate what he would do there. He had a degree in chemical engineering, but as far as he knew, an engineer “drove a train and wore a funny hat.” (As an aside, Judge Welling’s notable self-deprecating sense of humor is unmatched.) With that, he set out to find a job in engineering, which proved difficult if you did not attend Penn State or Drexel. All the while, he stayed attuned to the legal landscape in the country. The O.J. Simpson trial served as the backdrop to his East Coast job search. For months, he applied for various engineering positions, including as a writer for several scientific journal magazines. One finally granted him an interview and he schlepped his way to New York, preparing and practicing his best response to “What’s your biggest weakness?” While in the city, he visited his high school debate partner who was attending medical school at Columbia. They attended a party where young Craig met another medical student whose father was looking for an environmental engineer to work at his trucking company. Craig got the job and served in it for three years, sans the funny hat. As the years passed, he began to think more seriously about law school. However, although ever bright-eyed and forward-thinking, he still had a GPA problem. One of the perks of working for the trucking company was that it provided partial tuition. Craig enrolled in graduate school at Penn State and began working toward a Master’s degree in Environmental Engineering. He commuted from New Jersey where he lived, to Delaware where he worked, to Philly where he attended school three nights a week. This time around the academic circuit, he managed a 4.0 GPA. Finally, he was ready to apply to law school. Craig knew he wanted to return to Colorado and attend CU Boulder. Still, he wasn’t sure he had the credentials to be a Buff. So, he visited several law schools across the country, including schools in Seattle, New Orleans and Atlanta. However, when he received his CU Boulder admission letter, his decision was made. He and Kyung packed their things, excited and eager for their next adventure. On his way out of New Jersey, he made sure to keep the last receipt for the last toll he would pay, leaving the Garden State soundly in the rearview mirror. Craig and Kyung settled back into Colorado with ease. Indeed, Kyung’s job search resembled nothing of her husband’s Pennsylvania fiasco. She applied to two jobs, attended two interviews, and received two offers. And Craig found his place in law school. Indeed, he loved law school in a way that he just didn’t love undergraduate — but then, he understood law in a way he didn’t understand chemical engineering. Drawing on his winding journey home to Colorado, and home to the law, he offers two lessons for those considering law school. First, he suggests that one “should not go straight through from undergraduate to law school. Instead, travel, work or be a ski bum, because the essence of being a lawyer is dealing with other people’s problems, and if you haven’t had a chance to deal with a few of your own, you probably won’t like it.” Second, he suggests going to law school where one wants to practice. He would know. He thrived in law school. He served as editor of the Colorado Journal of Environmental Law & Policy, he participated in the Pace University environmental moot court competition, and he joined Rothgerber Johnson & Lyons, now Lewis Roca Rothgerber Christie, as a summer associate. Newly minted lawyer Craig would go on to work there several years. Eventually, he went on to serve as chief legal counsel to Governor Ritter. During his tenure as chief legal counsel, he played the role of lawyer and photographer, particularly during the Democratic National Convention. Indeed, Judge Welling is an incredible photographer and to date, shooting the DNC is one of his favorite photography moments. Still, lawyer Craig knew he wanted to eventually serve Colorado as a judge. It fit his personality. So, when the opportunity arose, he took it. In 2010, Governor Ritter appointed him as a district court judge to the Seventeenth Judicial District. 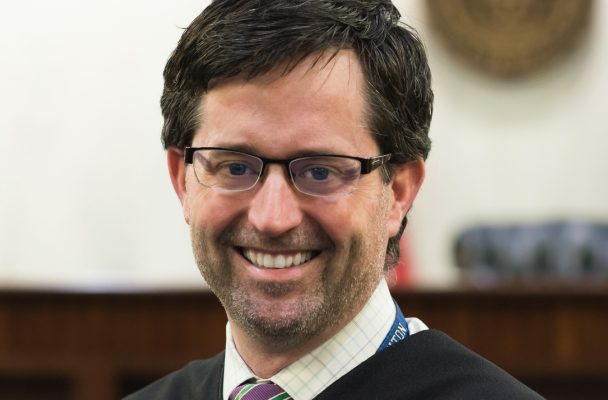 Six years later, Governor Hickenlooper appointed him to the Colorado Court of Appeals, replacing the Honorable Gale Miller upon his retirement. Upon his arrival to the Court of Appeals, he appreciated that the collegiality among the judges is as advertised. He also enjoys being able to take the time to really think about and contemplate difficult legal questions. He notes that he “can take a ‘deep dive’ into the law in a way that is not possible in the fast-paced environment of trial court.” However, Judge Welling remains grateful for his experience as a trial judge and believes he is a better appellate judge for it. Off the bench, Judge Welling loves spending time with his daughter, watching and playing soccer, attending Rockies baseball games, and grabbing a beer with friends — old and new. One of his favorite pastimes is his annual father-daughter trip every year to the College World Series.